Cindy Sheehan lost her son Casey in Iraq and camped outside Bush's summer home to ask him what cause her son died for. Thousands of people went to Crawford, Texas to join her in the vigil for peace. Why should he go on vacation while American troop continue to work overtime killing Iraqi civilians in Iraq? When the protest grew to hundreds Cindy Sheehan asked Food Not Bombs to provide food for the protest. Food Not Bombs jumped into action collecting food and setting up a kitchen across from Cindy's tent and started feeding the activists. These are three of Keith McHenry's drawings of the vigil that he made into prints. 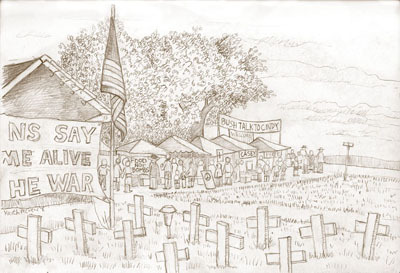 A print from a drawing by Keith McHenry during the first Camp Casey vigil outside Bush's summer home in Crawford, Texas. This is a print from a drawing of the pro and anti war sides of the street of Camp Casey. The tent that started Camp Casey drawn by Keith McHenry in August 2005.